A few weeks ago, I suggested a better cause for the Occupy Wall Street protesters. My theory is that while they are right that some groups have more political power than others and right to think in terms of class warfare, they are mistaken to construe the lines only in stark economic terms (the 1 Percent vs. the 99 Percent.) There’s another war — much more important in my view — that pits one class against another and is fully the result of specific government policies: the systematic transfer of wealth from the relatively young and poor to the relatively old and wealthy. This week’s chart illustrates this point. As you can see, in 1970, spending on Social Security and Medicare was one-fifth percent of the budget (blue portion). This portion has since grown to nearly 37 percent of the budget in 2010. By 2030, half of the entire budget will be consumed by payments for senior citizens. Other spending (red portion) — which includes a variety of mandatory programs (such as federal civilian and military retirement, veterans’ programs, and unemployment compensations) and discretionary programs (such as defense spending) — makes up a decreasing share of the budget in the future. 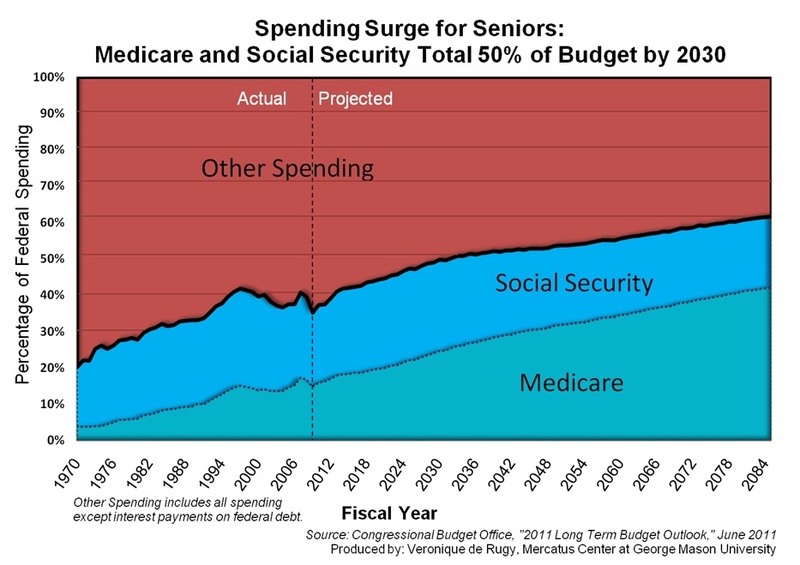 And this data actually underestimates the amount of federal spending for the elderly. According to the Centers for Medicare and Medicaid Services, some 28 percent of Medicaid spending also goes to older Americans living in poverty. This data is evidence that economist Scott Sumner is right (again) about the fact that income often is a misleading measure, which results in the adoption of inefficient policy measures. In this case, the focus on income data leads one to conclude that the elderly are in need of assistance. A focus on consumption data shows that some are but most aren’t. Sumner also argues that “income inequality data is nonsense, and wealth inequality data is nonsense on stilts. It’s all about consumption.” As such, he advocates the abolition of all income taxes (personal and corporate) in exchange for a progressive consumption tax.